​December’s birthstones offer three ways to fight the winter blues: tanzanite, zircon and turquoise – all of them, appropriately, best known for beautiful shades of blue. All of these stones are relatively inexpensive, but their beauty rivals even precious gems. Colorless zircon is a convincing replacement for diamond, tanzanite often substitutes sapphire, and turquoise is unmatched in its hue of robin’s egg blue. Whatever your style preference or budget, one of December’s three birthstones will match your true blue desires. 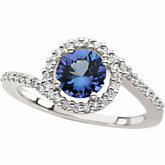 ​Unlike many well-known gems that have been in use for centuries, tanzanite’s history is relatively modern. The common story of tanzanite’s discovery tells of Maasai herders who found blue crystals in the Merelani Hills near Arusha, Tanzania, while tending livestock in 1967. They notified a prospector named Manuel d’Souza, who promptly registered claims with the government to begin mining. Initially, d’Souza thought he was mining sapphire, but the crystal was soon identified as a vibrant blue variety of zoisite – a mineral that had been around since the early 1800s. Tiffany & Co. recognized this blue gem’s potential to rival more expensive sapphire, and agreed to become its main distributor. Instead of publicizing “blue zoisite” – which sounded a little too much like “suicide” – Tiffany named the gem tanzanite to highlight its exclusive geographic origin, and introduced it with a promotional campaign in 1968. An estimated two million carats of tanzanite were mined before the Tanzanian government nationalized the mines in 1971. The government divided the mines into four sections, or blocks, in 1990. TanzaniteOne Mining Ltd., the world’s largest tanzanite producer, holds the rights to Block C, which is larger than the other blocks combined. An independent study from 2012 suggests, at a production rate of 2.7 million carats per year, that Block C’s tanzanite deposits may deplete in as soon as 30 years. Tanzanite may not have the long history of other gems, but with such limited supplies and rapidly growing popularity, it is highly prized for its rare beauty. Zircon is the oldest mineral on earth, dating back more than 4.4 billion years. Found in the earth’s crust, it’s common in most sands and sedimentary deposits, as well as metamorphic rocks and crystallized magma. Due to its chemical makeup, zircon has survived ages of geologic events like erosion and pressure shifts – recording these changes like a time capsule. Zircon contains the radioactive element uranium, which changes the stone’s chemical structure and color over time, giving us important clues about the formation of our planet. During the Middle Ages, people believed that zircon could induce sound sleep, ward off evil and bring prosperity and wisdom. Blue zircon, in particular, was popular during Victorian times, and frequently adorned English estate jewelry from the 1880s. Zircon with a cloudy or smoky appearance was also popular in mourning jewelry. In the 1920s, heat treatment became customary practice to enhance the color of zircon gems for jewelry. Zircon has also been used in the decorative ceramics industry. Today, zircon is considered a grounding stone that increases confidence and compassion. It is said it can bring visions into reality and provide the guidance needed to achieve goals. While zircon is popular among gem collectors for its range of colors, consumers seem most enamored with the blue variety, and otherwise confused about the history and possibility of this expansive gem. 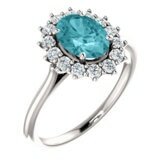 Cultures around the world have admired the distinct color of turquoise since ancient times. The earliest evidence comes from ancient Egyptian tombs, which contain elaborate turquoise jewelry dating back to 3000 BCE. Egyptians set turquoise in gold necklaces and rings, used it as inlay and carved it into scarabs. Most notably, King Tut’s iconic burial mask was extravagantly adorned with turquoise. Meanwhile, pre-Columbian Native Americans mined turquoise throughout the present-day southwestern United States. Shamans used it in sacred ceremonies to commune with the spirit of the sky. Apache Indians believed that attaching turquoise to bows (and later, firearms) improved a hunter’s accuracy. Turquoise became valuable in Native American trade, which carried North American material toward South America. 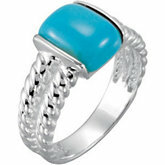 Consequently, Aztecs cherished turquoise for its protective power, and used it on ceremonial masks, knives and shields. The turquoise-studded silver jewelry that’s commonly associated with Native Americans today originated in the 1880s, when a white trader convinced a Navajo craftsman to transform a silver coin into turquoise jewelry. While many historic turquoise deposits have depleted over the gem’s long lifetime, some small mine operations (mainly in the U.S.) still produce fine material today.